I've read all of Harvey's books, and while I really enjoy the sarcasm and wit that she adds, I never actually enjoy her books with any intensity. 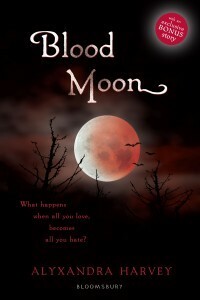 My Love Lies Bleeding is my favourite of her books, mainly because I really liked Solange, Lucy and Nicholas so when I discovered that Blood Moon was written from their POV's I was really excited and expected to love it. Sadly, I didn't. A couple of things hit me while reading this book that maybe I should have realised before. Firstly, I don't like that these books are written in different characters POV. I feel I became disconnected from the other characters whose POV I wasn't reading if they weren't interacting and I found myself completely forgetting what's been happening with some of the characters that were prominent in previous books, even down to forgetting whose dating who, with no reminders as we have very little interaction with them in this one. And in the last book, Bleeding Hearts, Christabel gets turned into a vampire, I would have liked to see how she was dealing with this but we only get a couple of glimpses of her. It's kind of like reading different books that just surround a similar theme, not a series. While I usually love reading books written from two or three POV's, I feel in this series, because there are so many different important characters in the Drake family, a third person narrative would have been more effective. Another thing, personally for me, I feel there are just too many characters, tribes and rituals and I was just completely losing track of who and what everything was. Some of these characters we get very little insight into throughout the series and when they're name popped up, I was like "who's that?" I was a little lost a lot of the time while reading this which obviously takes from the enjoyment of it. Maybe a re-read of the entire series after the release of the last book will change my opinion. I still really enjoyed Lucy and Nicholas in this one, though I would have preferred more interaction between the two. Most of the time they were apart as Lucy is now attending the Helios Ra school. Lucy is a really great character and my favourite from this series. I think if it wasn't for Lucy, this book would have been worse. I really didn't like Solange is this though. Having had little interaction from her since the first book, it was hard to see how downhill her character had gone. She is suffering from bloodlust along with a lot of other problems but won't go to her family for help, even when she realises how serious it could be. She completely alienates herself from them and spends her time with Constantine, who I'm not sure I'd completely trust. She just seems to want to be bratty and stubborn and cuts herself off from Lucy and Kieran too. I felt like I was only starting to enjoy this book when it finished. And to add insult to injury, it ends on a major cliffhanger with so many unanswered questions. One a really big one. I kind of felt like I had been cheated out of a part of the book that I was looking forward to reading. The ending was the best part of this but it didn't make up for the insipidness of the rest of the book. I really wanted to love this, but honestly, if it wasn't for events leading up to the ending, I don't think I would have even liked it. I will definitely be reading the last book in the series though. I couldn't not after getting this far into it, I need to see how it ends. And admittedly, the ending of this does seem to suggest that there could be interesting things to come in book 6. But who knows? Bummer! I think I would have preferred a third person narrative too if every book follows different characters. Isn't it annoying when you're not liking a book and it ends on a cliffhanger that makes it interesting? I hope you love the final book in the series, Suzanne! Aaaahhhh! Suzanne, I can't believe you didn't like this more, it's a shame because I adore them. I love the different POV's however, I kind of wished we'd not seen Solange's POV. She really annoyed me in this book but the rest I love. This one was so different from the rest because it's all action where I wanted more romance. Still loved it though. Great honest review.